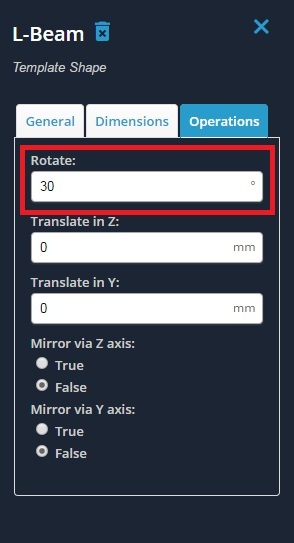 To perform a rotation, simply click that shape you wish to rotate. In the menu that appears on the right, click the 'Operations' tab. Enter the angle (in degrees) you wish to rotate your shape by. Note that a positive rotation is clockwise, and a negative rotation is counterclockwise. This is because the rotation is about the X axis which is into the page in direction.